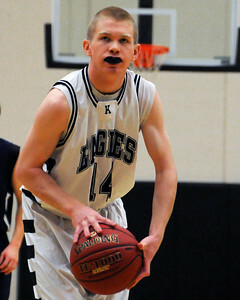 The Kennett High School Eagles basketball team hosted St. Thomas Aquinas, at Kennett High School, in Redstone, NH, on December 16th, 2011. 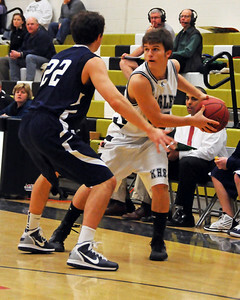 The visiting Saints defeated the Eagles, 65-43. 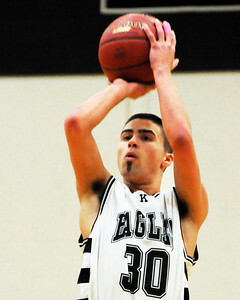 Kennett Eagles senior, Dustin Stewart, takes a fall away jump shot over St. Thomas Aquinas defenders during the December 16th game held at Kennett High School, in Conway, NH. 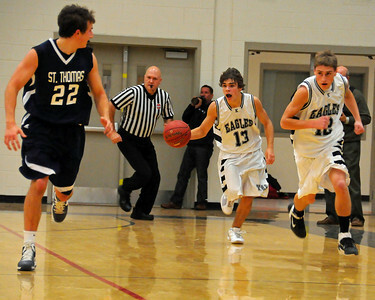 The visiting Saints went on to defeat the Eagles 65-43. 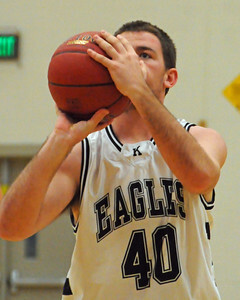 Kennett Eagles senior, Dustin Stewart, takes a jump shot over a St. Thomas Aquinas defender during the December 16th game held at Kennett High School, in Conway, NH. 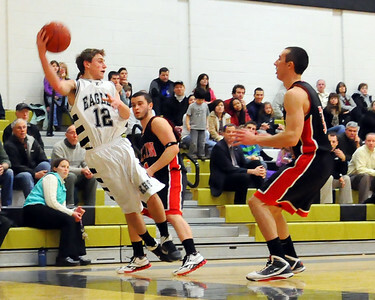 The visiting Saints went on to defeat the Eagles 65-43. 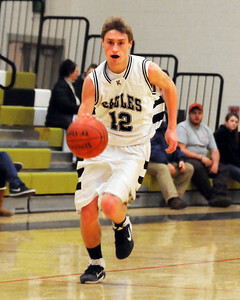 Kennett Eagles senior guard, Alex Milford, looks up the court during the December 16th game vs. St. Thomas Aquinas, played at Kennett High School, in Conway, NH. 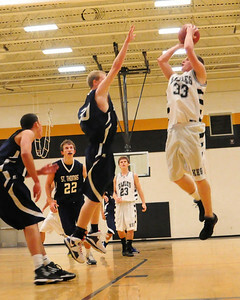 The visiting Saints went on to defeat the Eagles 65-43. 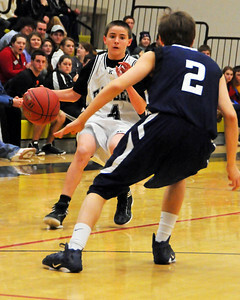 Kennett Eagles freshman guard, Brandon DiLucchio , looks for a way around a St. Thomas Aquinas defender, during the December 16th game, played at Kennett High School, in Conway, NH. 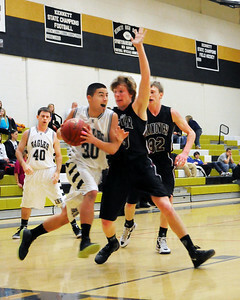 The visiting Saints went on to defeat the Eagles 65-43. 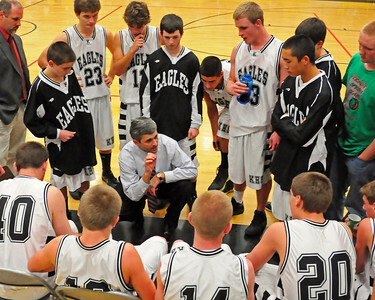 Kennett Eagles Head Coach, Steve Cote, speaks to his team prior to the start of the 4th quarter, during the December 16th game vs. St. Thomas Aquinas, played at Kennett High School, in Conway, NH. 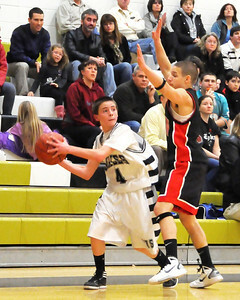 The visiting Saints went on to defeat the Eagles 65-43. 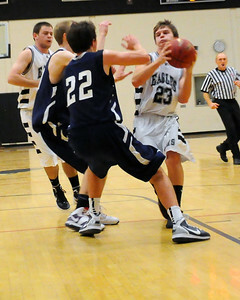 Ryan Vajentic, of the Kennett Eagles, gets pressure from two Berlin High School defenders, during a game played at Kennett High School, in Redstone on January 10th, 2012. 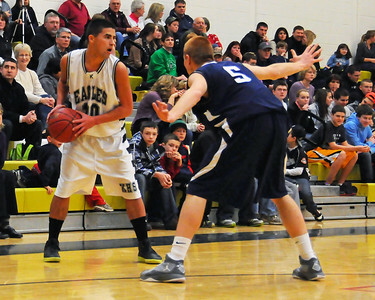 The visiting Mountaineers went on to defeat the Eagles 78-56. 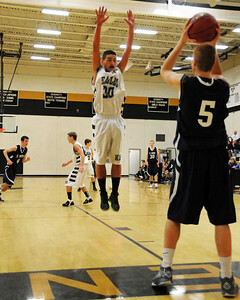 Berlin High School guard, Jake Drouin, takes a jump shot over a Kennett High School defender, during a January 10th, 2012, game played at Kennett High School in Redstone. 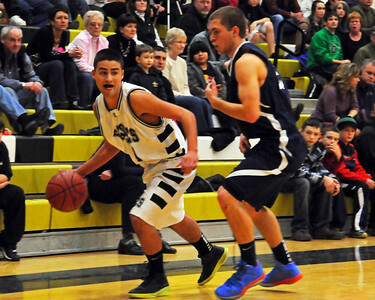 The visiting Mountaineers defeated the Eagles 78-56. 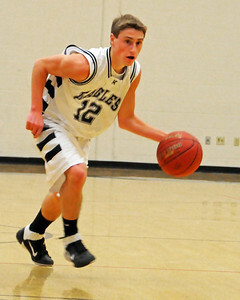 Alex Milford (#12), of the Kennett Eagles, keeps the ball in play, during a game against Berlin High School, on January 10th, 2012, at Kennett High School in Redstone. 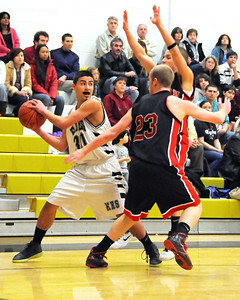 The visiting Mountaineers defeated the Eagles 78-56. 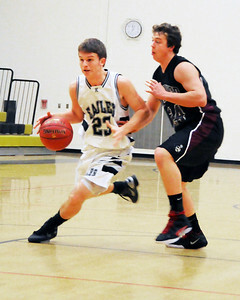 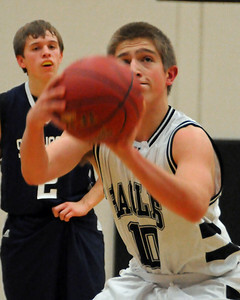 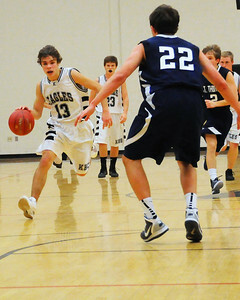 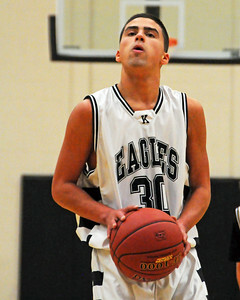 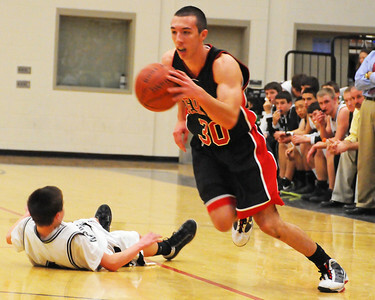 Freshman guard, Brandon DiLucchio, of the Kennett Eagles, looks around a Berlin High School defender, during a game played at Kennett High School, in Redstone on January 10th, 2012. 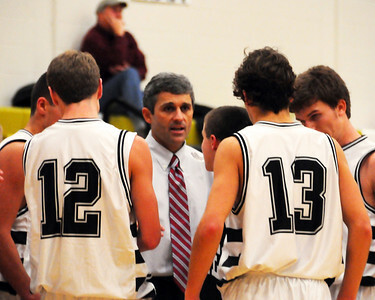 The visiting Mountaineers went on to defeat the Eagles 78-56. 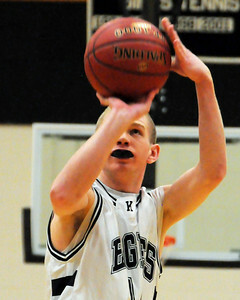 Alex Milford, of the Kennett Eagles, brings the ball upcourt, during a game against Berlin High School, on January 10th, 2012, at Kennett High School in Redstone. 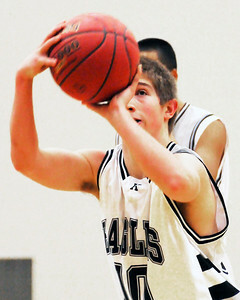 The visiting Mountaineers defeated the Eagles 78-56. 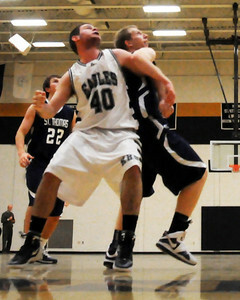 Seth Davison (right), of the Kennett Eagles, and Berlin High School forward, Zack Bacon, fight for a rebound, during a January 10th, 2012, game played at Kennett High School in Redstone. 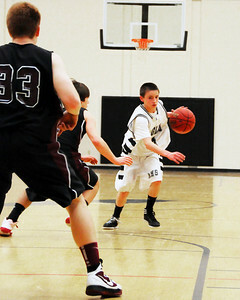 The visiting Mountaineers defeated the Eagles 78-56. 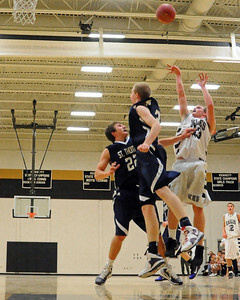 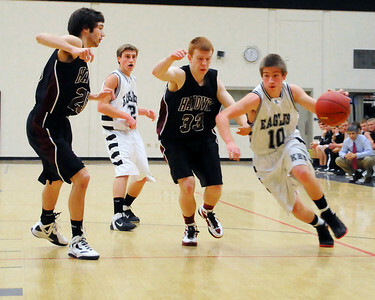 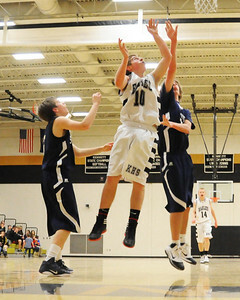 Berlin High School guard, Jake Drouin, moves between two Kennett High School defenders, during a January 10th, 2012, game played at Kennett High School in Redstone. 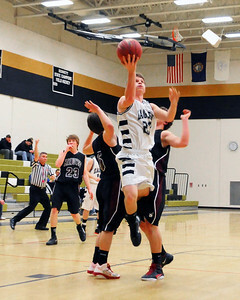 The visiting Mountaineers defeated the Eagles 78-56. 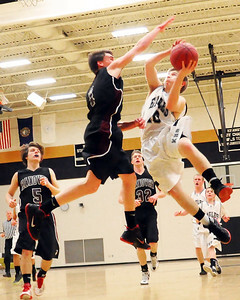 Berlin High School guard, Sam Aldrich, moves past a Kennett High School defender, during a January 10th, 2012, game played at Kennett High School in Redstone. 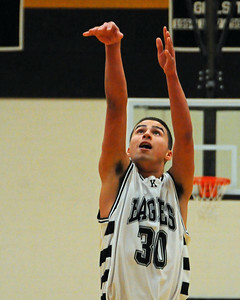 The visiting Mountaineers defeated the Eagles 78-56. 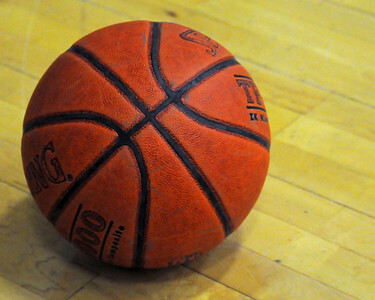 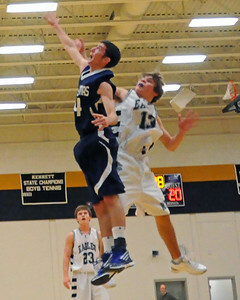 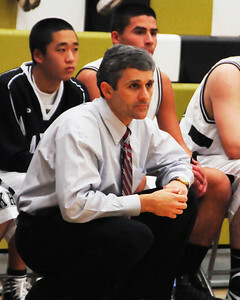 The Kennett Eagles basketball team hosted Hanover High School on January 24th, 2012, at Kennett High School in Redstone. 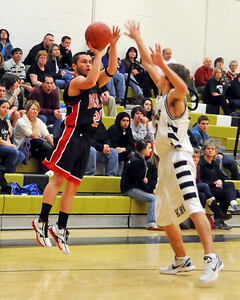 The visiting Marauders defeated the Eagles 67-25.